With over 337 million Active Users (MAU) as of Q1 2018 (Source: Statsista), Twitter sure is a place you cannot afford to miss being on as a business. While Instagram is doing great for B2C, LinkedIn for B2B, Twitter is surprisingly relevant to both and therefore has its own unique place. As an ex-VC, founder of two failed tech startups and now two successful ones, I’ve delved into every aspect of sales. and I have found Twitter to be highly effective and useful in this grand scheme of prospecting!! For businesses and brands, Twitter is so much more than just a platform to voice random thoughts. If on one hand, you have the Kardashians utilizing Twitter for their branding, it’s also a place where you get a chance to talk one on one with the real masters of the game like Elon Musk or Gary Vaynerchuk. However, I’m not here to tell you about either. I’d like to talk about the powerful yet underutilized purpose for Twitter in business – Sales Prospecting and lead generation! Before I delve deeper into the prospecting aspect, I’d just like to level the ground by sharing 3 steps that count for a good foundation before you begin your prospecting foray on Twitter. E.g. 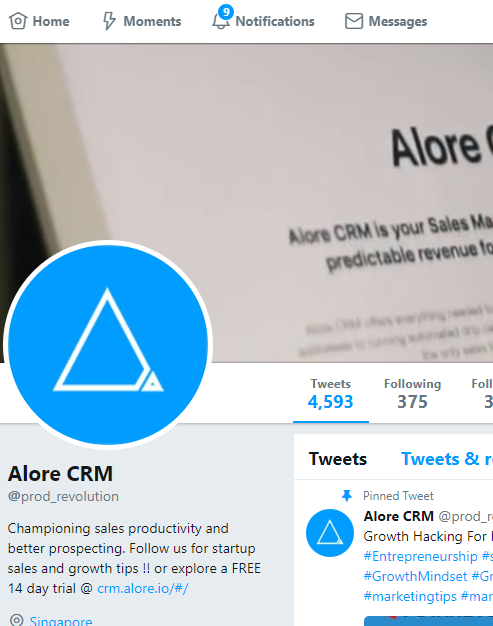 Our company Alore’s official account has our bio leading inquisitive minds to reach our landing page. It is important to have a clear aim of what it is that you want to achieve from Twitter. Is It Branding, lead generation, engagement, an extended version of Customer support, Thought leadership etc.? Once the goal is decided then drill down into the details of how you’d like to achieve that goal. While there are innumerable resources that would teach you about Twitter for brand building and customer engagement, I wanted to share some ideas on a lesser discussed yet really powerful use of Twitter- lead Generation. This one is a no-brainer but needs to be iterated to avoid getting overconfident with content. The quality of your posts will determine the share and reach velocity. Always have a visual in your tweet because it gets noticed 3X-4X more and the Twitter algorithm obviously favors visual content. You can ask questions in tweets to initiate a conversation and therefore engagement. Ideally, about 40% of your tweets must be aimed at nurturing relationship- Replies to people, retweets, likes etc. and yes, limit the number of hashtags to 5-7 to avoid making tweet look cluttered. You really don’t want your hashtags to dominate your tweet text. This is probably the easiest way to get noticed and engage with like-minded people and industry influencers. A simple Google research will help you identify key influencers in your industry and niche. Follow them and follow the people they follow. regularly (Re)tweet to the folks that are huge in your field. The idea is to be connected or noticed by influential- Technorati, entrepreneurs etc. Also, the real action of influencer engagement is in the comments section. So, to stand out in the crowd, craft well thought of replies and defend them well. You will notice that people will notice you slowly and you will build your own tribe within the tribe. If you can become a quasi-influencer over time, you’re kind of winning it. Twitter offers a list functionality where you can openly create public lists of people and accounts that you want to follow. This could be anything personal or professional e.g. as a SaaS company we have a list of “SaaS companies” created to keep in touch with the pulse of our ecosystem. These lists are public so in case you’re secretive about your work, then know this that your competitor can look up your list easily and now who you’re following keenly at the moment. Twitter offers the option to send a direct message to people who follow you. Use this wisely when you want to initiate a conversation with people. A lot of people have an auto-responders send messages to thank for the follow and lead them to a link they (the followers) could explore. This is the easiest way to find leads on Twitter. Let’s say you’re a freelance web designer. Your prospects and leads would be people having design needs right? 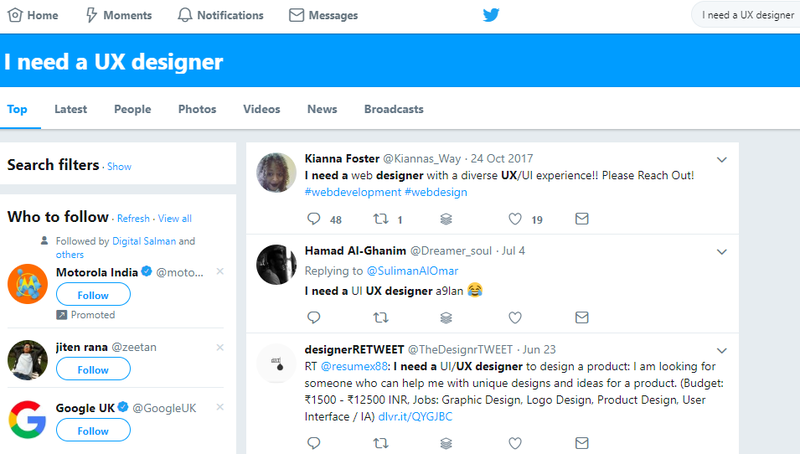 So when you just search for the phrase” I need a UX designer” the above search result comes up. Now based on the date range that you want to work with, start wooing and engaging with the prospects who are openly saying they’re looking for one. This one is actually a really simple yet super effective trick. Go to your competitors Twitter profiles – company and sales and business development executives. See who they are following and engaging with and then slowly start to like, follow and engage with the same set of people the competitor is following. This method gets categorized as lead generation via the pull of personal branding. Depending upon the industry niche post relevant content – If you’re in B2B – write innovative and useful content that positions you as the go to person for new ideas. If you’re a B2C person, talk about customer lives, product story, your own experiences around etc. You can’t be selling Kim Kardashian cosmetics if you’re Elon Musk – relevance is the key. e.g. Drift founder and CEO David Cancel regularly tweets on business, entrepreneurship, motivation, AI etc. He talks about what’s relevant to his business and the ecosystem around it. Also make it easier for people to find you. You could add your Twitter handle as part of your branding program e.g. in your email signature, visiting card etc. To find the right target audience, you can see through a number of ways. Google search being one, and thereafter playing smart with Hashtags. Create a list of hashtags that are industry relevant and then search for those. Here’s an interesting article to help figure hashtags if you’re confused how to start on that. On Twitter the more following you have the more of an industry influencer you are. I’m sure you’d agree to that. There are some really interesting ways to increase the number of followers. E.g. Tweetpup allows you to follow people from your industry niche (you set the keywords) and then automatically unfollow them after 3-4 days. 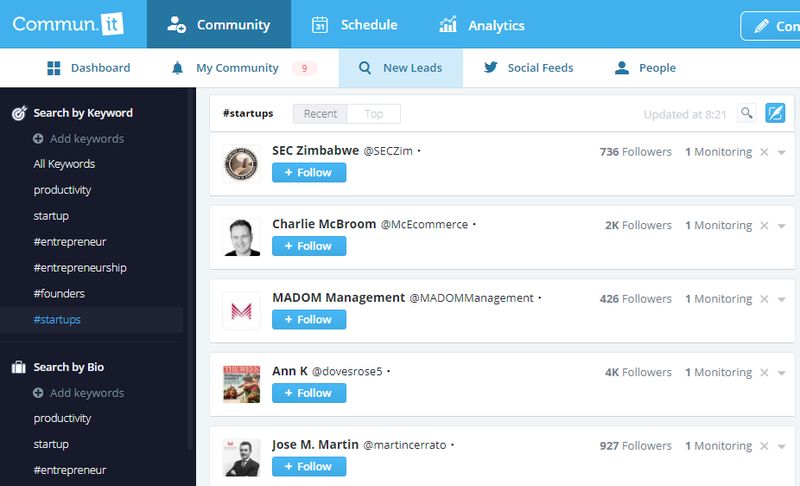 However, I prefer communi.it for its platform approach where a single tool allows me to schedule Twitter posts, follow unfollow and view my progress with advanced analytics. It just saves time and helps avoid jumping between tools. (As you can guess, I’m a he platform solution fan). This is another smart one where you harness the efforts of some smart marketers across the globe to do your work for you. It’s just this. First figure out what industry events are relevant to your business niche- category and geography wise. These days it’s common to have the organizing teams of events to create a Twitter event and a hashtag they’d like to trend. e.g. 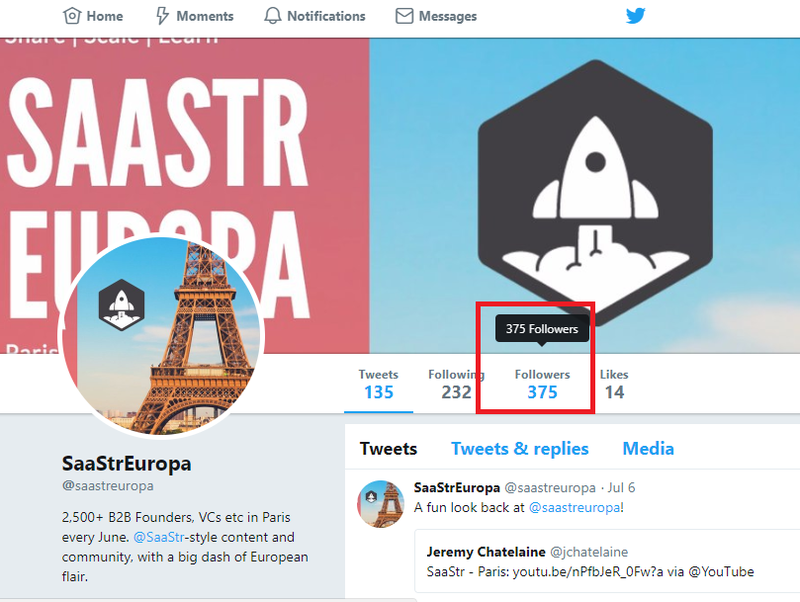 if you’re wanting to target SaaS founders, it would probably be a wise idea to follow SaaStr and see all those who follow the event and you have a readymade prospect list right in front. In fact this need to bridge social media prospecting to lead generation was the real reason that I decided to have this feature introduced in the CRM that we built. As technology improves by the second it’s a time when people yearn for a genuine relationship with people. Twitter is a place that creates communities and not a marketplace. Help people out in what they do, give a shout out etc. E.g. 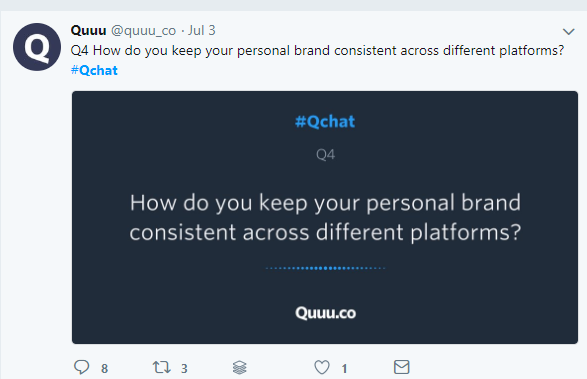 Content promotion company Quuu is active on Twitter as a community and organize periodic chats around certain themes. It brings in like-minded people to discuss, debate and question around a theme with an industry influencer or just among themselves. The real deal is you understand the market pulse, who’s interested in what and how passionate about the solution you’re providing. You need to champion your stakeholders and prospects to build an invisible bridge. People are always looking for quick recommendations. Everything from what sunscreen they should use to what CRM they should buy. If you use Twitter advanced research option (which is free btw). 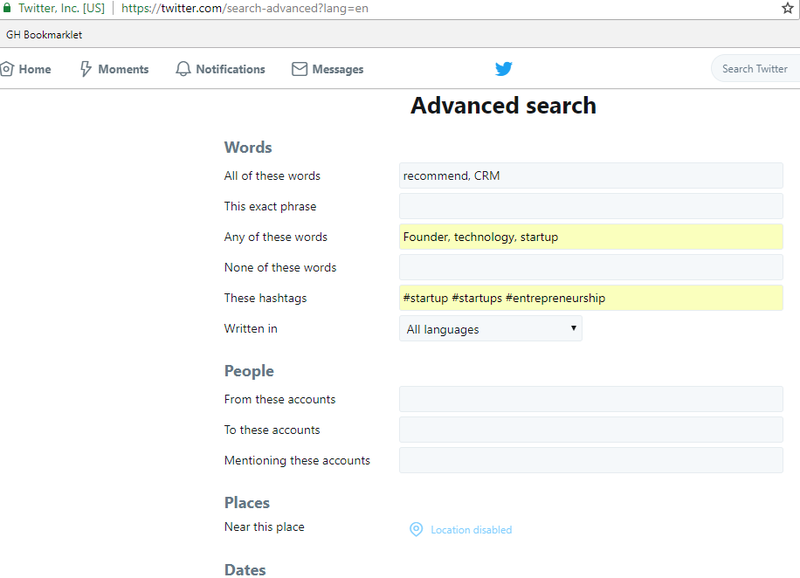 It allows you to filter tweets based on keywords, hashtags, people, designations and even location. To be able to truly engage with your community you need to give-give-give before you can make the faintest ask. But that’s what warming a lead is about right? Yes, there are some very interesting tools around that help you prospect better and generate warm and hot leads right off Twitter. Plugins like Click To Tweet make it easier for users to share company’s content via direct tweets of the quotes. This will ideally be part of sales enablement. 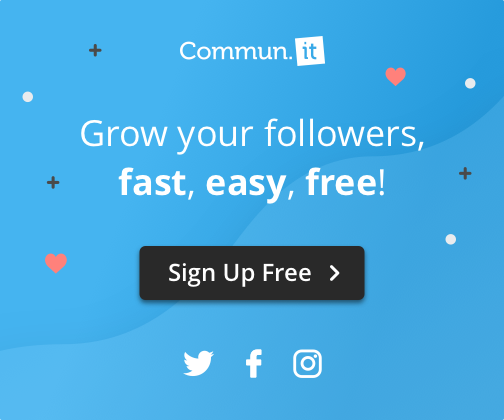 Use automated Twitter growth tools like Commun.it, Audiense which allow you to automate the process of increasing the number of followers when the tool automatically likes, follows and thereafter unfollows Twitter users. Tools like Commun.it, Buffer which help in social media scheduling comes in super-duper useful when it comes to scheduling Tweets and saving time. You can ideally schedule the entire week or month’s tweets in a day and thereafter just nurture personal connect with leads. Use tools like Hashtagify to find hashtags that are trending in your region. Twitter is a powerful platform where 500 million tweets are being posted everyday. As is the case with modern-day content, you need to sieve through this gargantuan content to spot the real value. Thankfully its easier than you thought with the number of tools that help navigate Twitter easily. Start with setting a Twitter goals and then drill your deep into achieving that goal. Use the tools to aid you in the process. With 42% of Twitter users being between 25-44 years old living in tech savvy countries like US, India, Japan and Indonesia and surprisingly even China. Source BusinessInsider). That’s a brilliant target demographic for most brands and a secret weapon in sales if used well ! Vikas is an ex-Clean Tech VC and serial entrepreneur. 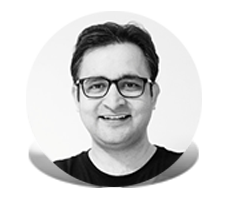 He is the CEO and Founder of Plash Digital, the parent company of sales and marketing productivity platforms – Alore CRM and Curated By Alore. Vikas began his career as a mercantile marine before he decided to do his MBA at the Rotterdam School of Management, The Netherlands.